Various regions of the world are facing water shortages. Mother Nature provides us with an adequate amount of clean water but it is not necessarily universally available where needed. In Part 1 of this series, water productivity was defined in terms of using available resources for their most productive use and the need to improve resource utility. Are we doing the right thing with our water resources? Could we do better? Part 2 includes some site examples of water productivity. Not all water used by mankind has to meet the same standards and not all water used is for equivalent productive endeavors. Why then do we wash cars and flush toilets with drinking water? In the one-size-fits-all world of water distribution, we have to offer the best grade of processed water regardless of intended use because it all goes through the same pipeline. As we shall discuss in Part 2, that is not necessarily the best way to do things. Mother Nature does not supply rainfall in accordance to local needs. Areas near Houston, TX received more rainfall in one recent May storm than had Los Angeles, CA over the past four years. When Mother Nature fails to provide a replenishment supply of precipitation, many cities and regions have nowhere to go because all of the other sources are already tapped out. This is the current situation in the southwestern US. There are just no new sources available. Or are there? Roughly 40 percent of California’s agriculture value is exported. (2) That means that 32 percent of the state’s water (40 percent of 80 percent) is exported as virtual water. The top crops are alfalfa, cotton, rice and almonds. Seventy percent of the alfalfa is eaten by cows and 30 percent is exported. (2) On average, California produces about $1,500 worth of product value per acre foot of water used to grow it (an acre foot = 326,000 gallons). Cotton produces about $791/acre in economic value per acre foot of water used but alfalfa only $175. To improve water productivity, California should not be growing low-cash crops such as wheat, corn, cotton and alfalfa. (3) A water productivity expert would ask: “Is this the best use of limited water resources?” Every region of the world has to ask that same question. “Is this the best we can do with what we have?” If the resource is limited, put what you have to the best use. How does the $1,500 of value per acre foot compare to other uses for the state’s water? One acre foot per year would support three average families who, according to the US Census Bureau for 2014, would have added $185,000 of income value to the state product totals. That shows a considerable advantage to getting more from available resources. Agriculture cannot economically compete with the urban/industrial sector for water. This is particularly true when you consider that the residential sector pays over $1,600/acre foot for water and the average agricultural user pays only about $70. (3) As a state, California simply is not using its water resources wisely. But people need food. It has to be grown somewhere. 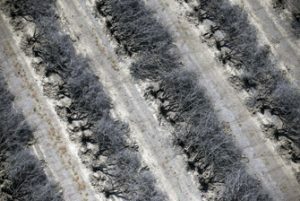 In a sobering report, the State of California Department of Food and Agriculture came to the conclusion in their 2014-2015 farm statistic review that California is now faced with retiring agricultural land from production to provide the most likely new source of water for the urban/industrial and environmental sectors. (2) That will improve their water productivity but is that the only source of new water? Water is written as the chemical compound H2O. It can exist in this form as a solid, gas or liquid under any conditions. What makes water unique is that it never goes away. We’ve had the same amount with us on the planet for millions of years. Unlike elements that undergo chemical and physical changes when they react, water does not undergo chemical changes when it freezes, melts boils or evaporates. Water is part of every living thing. It makes up a substantial portion of most liquids, animal and plant tissue and the excess (which is 99.999 percent) can be seen as clouds, lakes, rivers and the seas. Water is a carrier, a solvent for moving things around and cleaning up after them. It isn’t found anywhere in nature in its pure form but rather as a dilute solution of salts. Even melted snow contains a few ppm of dust and dissolved gasses. It is impossible to completely purify water by totally removing the salts (read that as contaminants) from it. Mother Nature, however, does a very nice job purifying water by removing the water from the salts using evaporation via the hydrological cycle. The removal of water from its contamination source is one of the very key elements of water recycling because it doesn’t matter what percent of the water you remove or what was in it, only that it is removed and whatever contaminated it is left behind. There are those (uninformed and misinformed) who believe that once water touches something, it carries the contaminant forever: i.e., the water contained in household and industrial waste can never be used for drinking water again. Fortunately, this is not true. Once the used water is separated from its contaminant, it is simply water again and can be reused, just as if it had been reprocessed by Ma Nature herself. How pure is purified water? Seawater is on the high side of the TDS water range with 35,000 ppm TDS. That’s still 96.5-percent pure water. Local lakes or rivers might be 500 ppm or 99.95-percent pure water. Putting it through reverse osmosis can raise the purity to 99.999-percent pure and after post deionization, 99.99999 percent. But humans do not require pure water and manage quite well with water in the 100-500 ppm TDS range, providing toxic elements, (metals, chemicals, arsenic, hydrocarbons, drug residuals, bacteria and other microbes, etc.) have been removed through treatment and the water has been properly disinfected. Municipal water supplies almost always come downstream from some other city’s discharge. The Colorado River, which used to run about 50 ppm dissolved solids and discharged an average of 44,750 acre feet of water/day into the Sea of Cortez in Mexico now reaches more than 2,000 ppm in TDS at its mouth and doesn’t even flow into the sea most of the time. It is totally consumed. Ten percent of the river flow goes to Mexico. Of the 90 percent taken by the US, 70 percent goes to irrigation with 30 percent for municipal uses in Nevada, Arizona and California. But is recycled water safe water? Why not reuse this water rather than throw it away? Saving water by taking crops out of production. Great idea. But there is little incentive for the ‘up-river’ city to do so. Treatment plants cost money and if TDS reduction is needed for improved utilization, there has to be a place to dispose of the concentrate. Las Vegas, NV, for instance, receives a credit to the tune of 90 million gpd for the treated sewage they dump back into Lake Mead. They pull that 90 million gallons back out further upstream where it requires less treatment. Perfectly okay—water is water. Recycling that water for non-potable needs also requires a second delivery system: another set of pipes. Most cities that do recycling have a few large customers to minimize the added infrastructure for delivery as opposed to offering it to every water user. Who is in the best position to utilize water reclamation? If a city is up-river with a fresh supply of low TDS water available at all times, there is little incentive to do any reclamation or recycling. As we move downstream, the water becomes higher in TDS and it can sometimes be difficult to reclaim the water without major treatment. 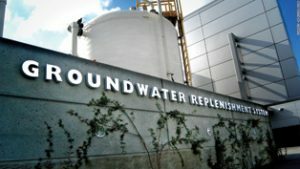 Chloride restrictions for reclamation plants near Los Angeles have led to serious restrictions on the use of home water softeners because the wastewater that is reclaimed is used by farmers for crops with moderate chloride sensitivity. Coastal communities have the most opportunity to fully reclaim wastewater. They have to be concerned about seawater intrusion into groundwater. Being at the end of the line, they have pretty much tapped all of the available resources of new water coming from hundreds of miles away. They have to make do with the resources they have. They have a ready-made disposal site for waste brine from any purification process (the ocean). And they certainly have the incentive to create additional sources of new water. The yuck factor does not come into play because reclaimed water does not directly enter back into the delivery pipes. It is, instead, put back into the groundwater supply where it eventually finds its way back to the feed side. It is also a convenient way to fend off seawater intrusion to preserve the local groundwater. The granddaddy of all plants is Plant #21 in Orange County, CA, which contributes 100 million gallons of well-treated wastewater to the local aquifer each day. It’s not a waste treatment plant. It’s not a water reclamation plant. It’s a groundwater replenishment plant. That sounds better and avoids the yuck factor. The sanitation districts of Los Angeles County currently operate 10 water reclamation plants and one ocean discharge facility, which treat 510 million gallons of wastewater per day, making 165 million gpd available for reuse. Cities in need have come a long way on improving their water productivity over time. Necessity is, indeed, the mother of invention. California, however, still releases 1.5 billion gallons of treated wastewater per day into the ocean (about 40 gal/person/day). This could go a long way toward relieving serious water shortages. The best source of new water might well be used water. In Part 1 of this series, we took a look at the yuck factor as being the only real drawback to water reclamation and reuse. The technology is here as is the need. In Part 2, we point out that reclaimed water from any waste treatment plant is an excellent source of new water and that the southwestern US could make more of an effort to utilize this source to a higher degree. Water is infinitely reusable; slightly used water is readily available and may well be our best new source of fresh water. In Part 3. we will review the technologies used for complete water recycle and how the homeowner and local water treatment professional can do their share to help and profit. 1. Hanson, Blaine. Irrigation of Agricultural Crops in California, Univ of CA, Davis, 2012. 3. Cooley, Heather. California Agricultural Water Use, Pacific Institute, (www.pacinst.org) April, 2015. 4. Michaud, C.F. Factors Affecting the Brine Efficiency of Softeners, a paper presented at the PWQA Annual Convention, September, 2010.